The Mulhearn Family has been helping the families of Northeast Louisiana pre-plan their funeral services for over 50 years. As funeral directors, we see the benefits of pre-planning to the families we serve daily. By planning in advance your wishes are known to your family members. You have relieved your family from making those emotional decisions and the financial burden of paying at the time of need. Pre-Planning is the most caring and considerate choice you can make for surviving relatives. 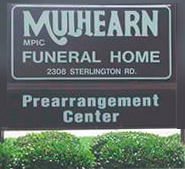 Only with a Mulhearn Funeral Home Plan can you select your funeral arrangements, flowers, family cemetery property, and memorial monuments in the convenience of your home. One of our family members or planning counselors are available daily. We also have many families that have pre-planned their services and have personal insurance policies set aside to pay for expenses in the future.